For many people, lack of space at home means they have to come up with inventive ways to solve their storage problems. Ideas that keep your items stored out of view are perfect for a clutter-free existence and can be really cool. Here are some inspiring examples worth considering for your home. The staircase, whilst functional, also makes for a unique place to store items away from view. Some people have converted the sides of the staircase into pull out drawers, which can actually store quite a lot of things. 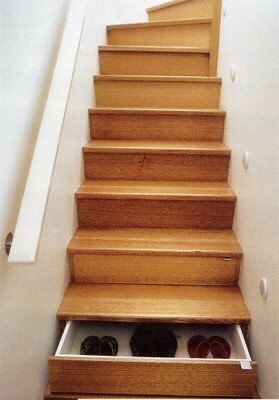 Whilst the actual steps themselves can also serve as handy drawers for storage. Built-in kitchen units are great for storing cooking paraphernalia away, but there are often small, under utilised spaces in most units that could be converted into hidden storage, for items such as herbs and spices or a tea towel rack. Under floor space can make for great hidden storage solutions, and is perfect for storing away treasured possessions that are out of view, should your house get broken into. But, there are tons of other uses for under floor space, including hiding toys away from kids prior to their birthday. Storage built into the wall of a room, so it gives a seamless finish is a really good way to cleverly store items out of view. It’s a useful idea for any room, including the kitchen, bathroom and bedroom. It blends in with the rest of the room so can look elegant and stylish. There is something quite mystical and magical about a bookshelf that doubles up as a doorway to a secret room. Not only will it be a focal point for your home, but it’s a really great idea that doubles up as storage space. For people with small spaces, where they may have to double the use of their bedroom as living space, a bed that can be stored away and folded into the wall or even up towards the ceiling is a perfect storage solution. There’s also something very glamorous and movie-like with this type of set up. Even if you don’t have a fold away bed, make the most of space under the bed for storing items away. The end of kitchen benches are often redundant spaces, but box shape designs can easily have their end sides converted into useful storage space for hiding away a multitude of kitchen paraphernalia. The long, deep spaces mean that you should be able to make use of a lot of storage area. It may not be the most obvious of places for storing items, but a ceiling can often provide handy space for storing. As most people aren’t likely to look up at the ceiling, chances are your items will be kept nicely out of viewpoint. Some people have chosen to have bookshelves high on the ceiling, or even boxes to store electrical cables off the floor. Rebecca Fox enjoys writing about all things storage, with a focus on keeping a home organised and stylish. You can find her writing over at Bingham Self Storage.